Topic: Im confused ... This for my cracked oil filer cap housing or? Re: Im confused ... This for my cracked oil filer cap housing or? Clearing any diagnostic trouble code doesn't resolve the issue and believe me when I say that I wish it was this easy. There is all 3 of mine and looking to add a c30R sometime soon. 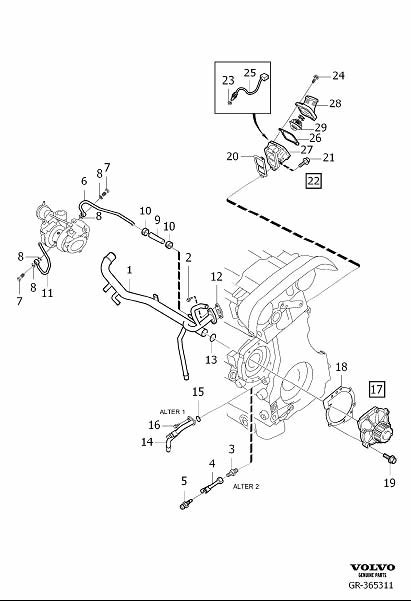 Diagram showing coolant pipes and fittings behind the block -- water pump, turbo cooling, and thermostat. It's not in this diagram, its parts of that pcv pn # listed. After 5 days with no codes being pulled, I finally got a P0336 code today. Crankshaft position sensor is the suspect! I'd take timing belt cover off and check everything.